The Dell XPS 13 has been favorite laptop for the last three years and now it has a convertible brother with the Dell XPS 13 2-in-1. Unlike some other laptop makers, Dell hasn’t just slapped on a new hinge, labeled the new machine as a hybrid and called it a day. 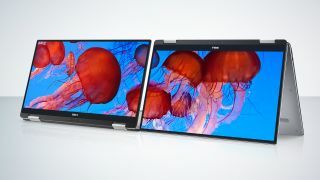 The Dell XPS 13 2-in-1 is practically a new notebook that’s thinner and lighter, measuring 0.54-inches tall and weighing 2.7 pounds. Dell claims this is the smallest 2-in-1 laptop on the market. Overall, the XPS 13 2-in-1 is 15% smaller than the HP Spectre 360 and 17% smaller than the Lenovo Yoga 910. To get here, Dell swapped out the Kaby Lake Intel Core I-series processors we find on the clamshell model for a pair of power-sipping Intel Core i5-7Y54 and Core i7-7Y75 chips. Going thinner has also resulted in the disappearance of all the full-sized USB ports and a smaller microSD card slot. Despite these sacrifices, the 2-in-1 XPS 13 retains a backlit keyboard with keyboard that offers actual key travel and a trackpad that still clicks unlike most other ultra-thin machines. Additionally, you can get a ton of configuration options including, up to 1TB of SSD storage and 16GB of DDR4 RAM. The 2-in-1 variant also gains an infrared camera, allowing you to use facial recognition to login through Windows Hello, which isn’t available on its traditional clamshell brother. The convertible’s steel wrapped-machined aluminum hinges also ends up giving the machine a more aggressive forward slant and futuristic silhouette. As ever, Dell’s 5.2mm InfinityEdge bezels returns with this hybrid laptop plus a new sheet of Corning Gorilla Glass to cover the screen. The Dell XPS 13 2-in-1 will be available starting on January 5th for $999 (about £810, AU$1,390). Alongside the smallest convertible laptop we’ve ever seen, Dell has also introduced its first HDR monitor, the Ultrathin 27-inch S2718D. Offering a QHD resolution of 2,560 x 1,440 and 99% sRGB coverage, the Ultrathin 27-inch monitor is one of the most color accurate and pretty displays we’ve ever laid our eyes on. What’s more it also integrates USB-C connectivity for single video/data/power cable management. The Dell Ultrathin 27-inch S2718D will begin shipping out on March 23rd for a non-too-shabby $699 (about £570, AU$970). Will Dell also win a top slot in our best 2-in-1 laptop lineup?